Stitchin' Bints: Woolly Wednesday - More projects in progress than ever! Woolly Wednesday - More projects in progress than ever! It's good to have Woolly Wednesday back, thank you Dawn, and for the first time in a while I've remembered on the Wednesday itself. 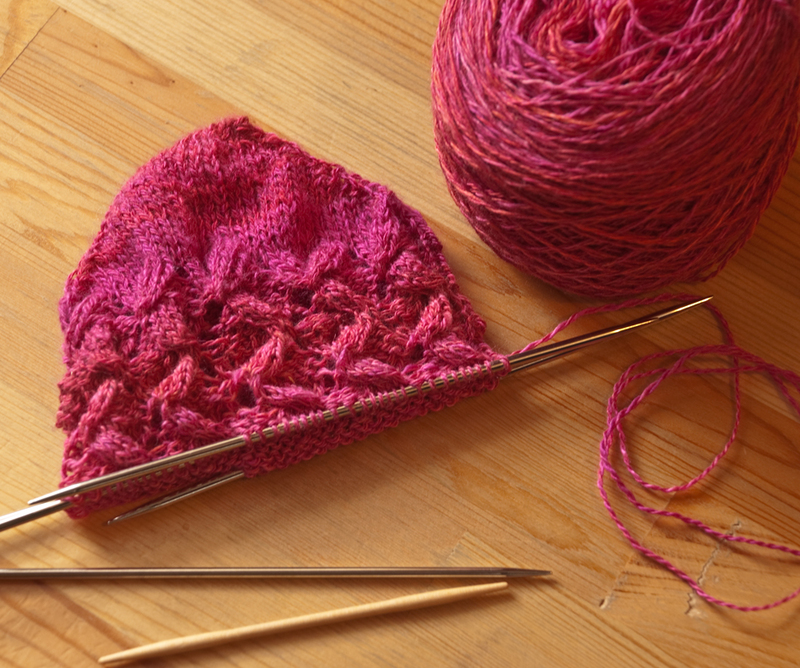 Despite my efforts I now seem to have more projects in progress and on the starting lines than ever. I'm having to clear a new shelf for my stash. How did this happen?? First of all I'd like you to meet Twinkle Twinkle. She's finished and is the spin/dye/knit project I'm most proud of ever. I worked very hard to finish her in the week leading up to Wonderwool so that I could wear it there. 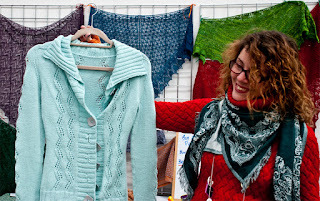 That was without knowing that Ruth of Rock n Purl, the designer of the pattern, would be there, so it was the highlight of my day to meet her. 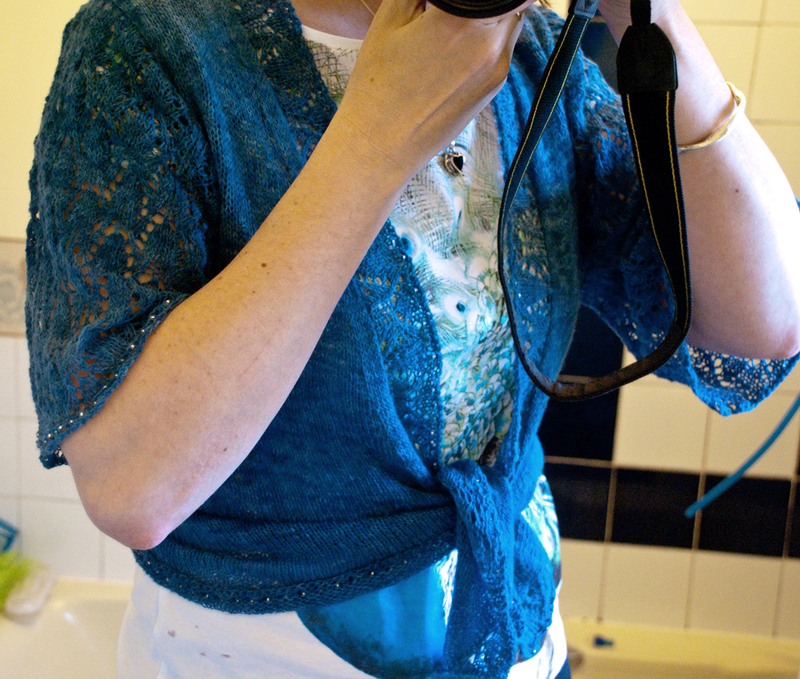 I love her work and bought the pattern for this warmer cardi, ironically called Glacial. 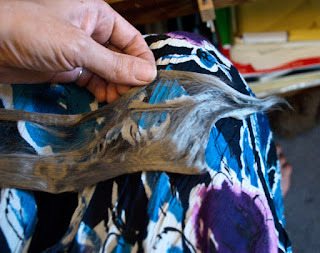 Also in the picture above (looking more blue than it really does) is this 'Seriously Gorgeous' Mohair/Silk. Despite looking like fluff for spinning, it's very fine yarn with a real halo, dyed in a sophisticated deep green. It's very difficult to resist casting on right away using one of the patterns from the Victorian Lace book I've bought this week. As if all that isn't enough to be getting on with, I bought some stainless steel a while ago. It's very fine, almost soft and fluffy like wool tops. 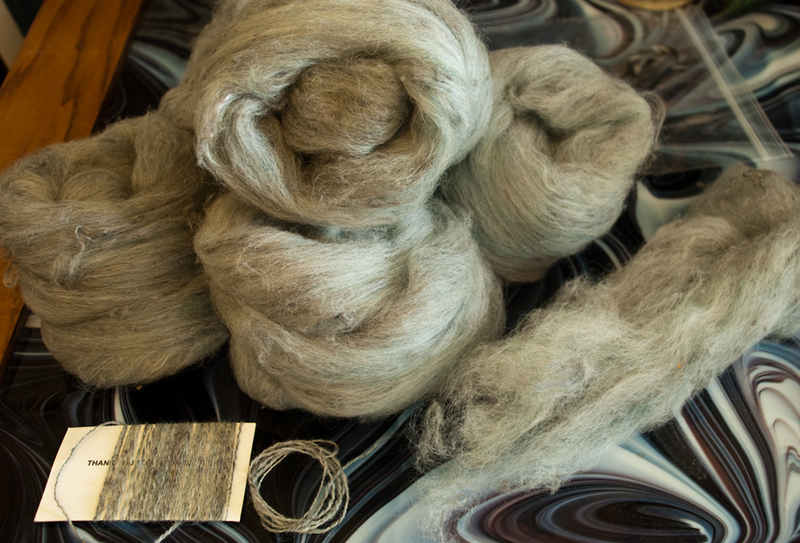 I've carded it with wool; white with a little green to achieve this metallic grey / green colour. After passing it through the carder a few times, the colour (and hopefully the metal fibres) are well-distributed and it's started to take on that 'stays where you put it' quality, although not to the extent I expected. Your Twinkle Twinkle is beautiful, and how lovely to meet the designer wearing it too! 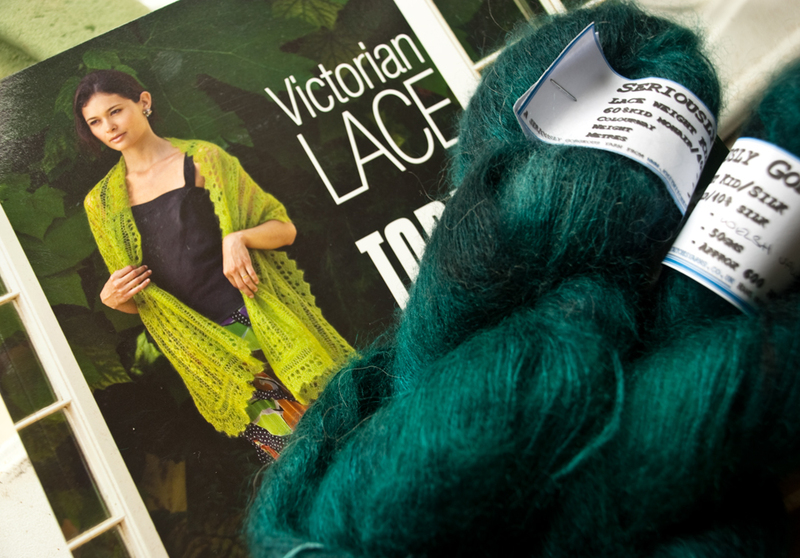 The mohair/silk green is a gorgeous colour too, so deep and bright. I'll be interested in your experiences with the stainless steel fibre after reading about it recently on ravelry and the internet, is there a plan for the yarn? Love your Twinkle Twinkle beautiful colour. 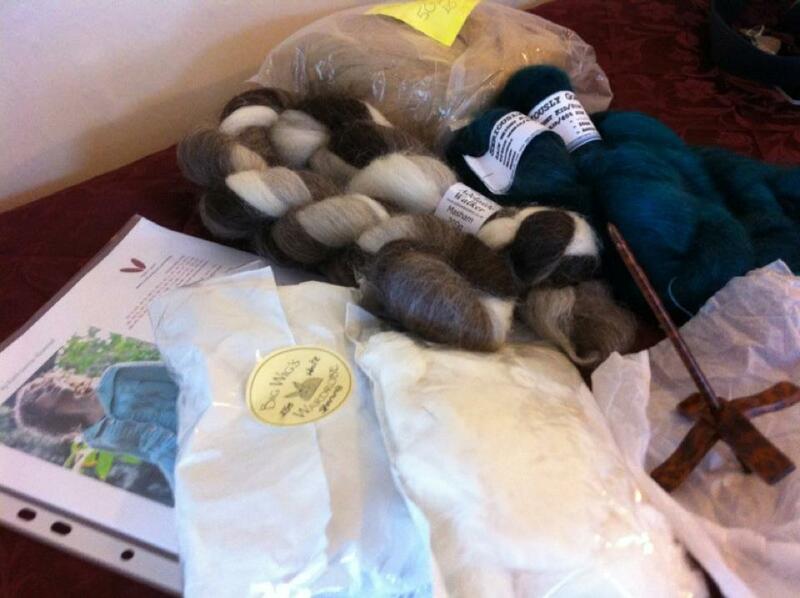 I bought a similar braid of Shetland from Adelaide Walker so it will be interesting to see what we make from it. I've been the worst at remembering Woolly Weds but I'll try to be on time in future (famous last words). It's a good way to track progress of current WIPs and chat to others. Thanks Sassy, yes, looking forward to seeing what you make. LOVE Twinkle Twinkle - you are very clever!